A quick post today as we are going to enjoy the warm, rain-free day! This recipe has been featured on many many blogs and is originally from Dorie Greenspan. Please do not see the LONG recipe below and be scared. This is one easy dessert to make with very common ingredients you probably already have. This is not actually that ‘quick’ of a recipe unless you have the components ready to assemble so plan ahead by a day if you want to serve this. This dessert has been our ‘go to’ dessert for entertaining this summer. We can’t get enough. The great thing about this recipe is that there only 3 components: the tart shell, the pastry cream and the berries. You can easily make the first two components a day or so in advance and then assemble when you are ready to serve. Like I said, that is where the “quick” comes in. Assemble and serve! The Taste Tester is in love with this recipe. Quite literally, he has begged and pleaded for me to make this again, even though we just had this last week. He at the entire tart (well, all except for 1 piece that I ate) in one day. I prefer if it is assembled about 3-5 hours before serving as the pastry cream softens the crust ever so much and makes it easier to eat with a fork. I would not change a thing about this tart, it is easy to make, easy to assemble and such a great way to highlight fresh berries. Each component really does compliment the others and comes together to make this amazing dessert that is sure to impress your family and friends. The crust is light in texture with a slightly sweet flavor. The cream is rich and smooth with a slight vanilla flavor. The berries hold their own and make you thankful for summer. Smooth the pastry cream by giving it a couple of strong turns with a whisk. 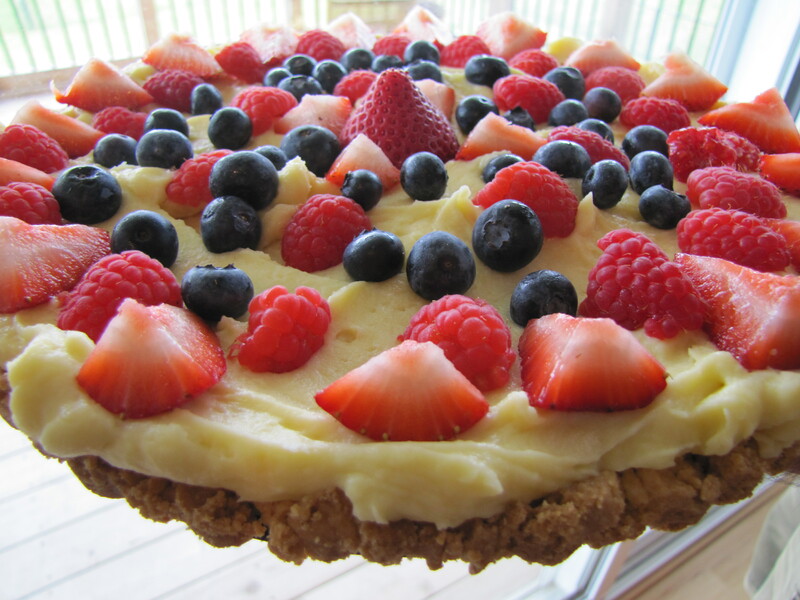 Spoon enough pastry cream into the tart crust to come almost to the rim, then even the surfact with a rubber spatula. Carefully lay the berries on the cream, arranging them in any pattern that pleases you. If you are using strawberries, either halve them from top to bottom or slice them, depending on the size of the berries and your whim. Bring the jelly and the water to a boil in a microwave oven or on the stovetop. Working with a pastry brush or a pastry feather, dab each berry with a spot of jelly. Or, if you like, you can glaze the entire surface of the tart, including the bit of pastry cream that peeks through the berries. Meanwhile, in a medium heavy bottomed saucepan, whisk the yolks together with the sugar and cornstarch until thick and well blended. Still whisking, drizzle in about 1/4 cup of the hot milk- this will temper, or warm, the yolks so they won’t curdle. Whisking all the while, slowly pour in the remainder of the milk. Put the pan over medium heat and, whisking vigorously, constantly and thoroughly (making sure to get into the edges of the pot), bring the mixture to a boil. Keep at a boil, still whisking, for 1 to 2 minutes, then remove the pan from the heat. Whisk in the vanilla extract. Let sit for 5 minutes, then whisk in the bits of butter, stirring until they are fully incorporated and the pastry cream is smooth and silky. Scrape the cream into a bowl. You can press a piece of plastic wrap against the surface of the cream to create an airtight seal and refrigerate the pastry cream until cold, or, if you want to cool it quickly – as I always do- put the bowl into a larger bowl filled with ice cubes and cold water, and stir the pastry cream occasionally until it is thoroughly chilled, about 20 minutes. Put the flour, confectioners sugar, and salt in a food processor and pulse a couple of times to combine. Scatter the pieces of butter over the dry ingredients and pulse until the butter is coarsely cut in – you should have some pieces the size of oatmeal flakes and some the size of peas. Stir the yolk, just to break it up, and add it a little at a time, pulsing after each addition. When the egg is in, process in long pulses – about 10 seconds each- until the dough, which will look granular soon after the egg is added, forms clumps and curds. Just before you reach this stage, the sound of the machine working the dough will change- heads up. Turn the dough out onto a work surface and, very lightly and sparingly, knead the dough just to incorporate any dry ingredients that might have escaped mixing. Butter a 9″ fluted tart pan with a removeable bottom. Press the dough evenly over the bottom and up the sides of the pan, using all but one little piece of dough, which you should save in the refrigerator to patch any cracks after the crust is baked. Don’t be too heavy-handed – press the crust in so that the edges of the pieces cling to one another, but not so hard that the crust loses its crumbly texture. Freeze the crust for at least 30 minutes, preferably longer, before baking. Preheat the oven to 375. Butter the shiny side of a piece of aluminum foil and fit the foil, buttered side down, tightly against the crust. (Since you froze the crust, you can bake it without weights.) Put the tart pan on a baking sheet and bake the crust for 25 minutes. Carefully remove the foil. If the crust has puffed, press it down gently with the back of a spoon. Bake for another 8 minutes or so, or until it is firm and golden brown. (I dislike lightly baked crusts, so I often keep the crust in the oven just a little longer. If you do that, just make sure to keep a close eye on the crust’s progress- it can go from golden to way too dark in a flash.) Transfer the tart pan to a rack and cool the crust to room temperature before filling. Wow, if the title of this dessert is not enough to tell you to make this then let me assure you that you must make this dessert. Do so now. It is so simple, so rich, so chocolatey, so perfect that you can not afford not to make this. My pictures do not do this dessert justice so I will send you to pictures that will knock the sweet bajeezes out of ya. This is no ordinary ‘cake’, because there is no flour in this recipe its texture falls closer to that of a cheesecake but more dense. This is the perfect dessert for any chocolate lover or lover of a damn good dessert. 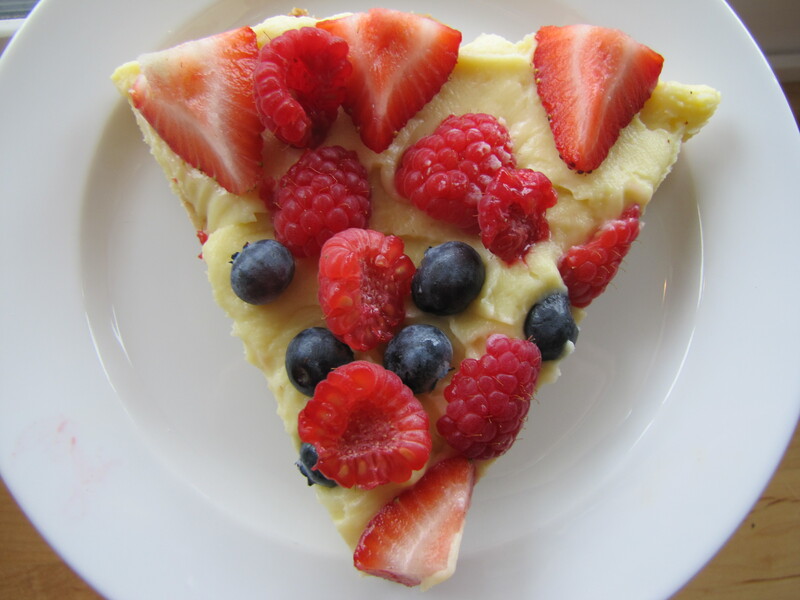 It has a gorgeous presentation without being pretentious, you can dress it up with some berries or white chocolate drizzle or keep it simple and plain (I use this term loosely). This exceeded my expectations (and I had pretty high expectations) and impressed everyone who tried it. I would describe the experience of eating this cake as nothing short of bringing your tastebuds and tounge orgasmic pleasure. So rich, so creamy with the perfect balance of sweetness, creaminess and richness. The chocolate ganache was the perfect way to top off this dessert and I would not skip it! I thought the amount of coffee called for in the recipe would over power the flavor, but I trusted the recipe and followed it to the letter. I would not change a thing. I think the coffee enhanced the chocolate flavor without overpowering it, infact, no one who ate a piece of this perfection noticed any coffee flavor at all. Of course they wouldn’t have been able to tell me if they had because their eyes were rolling back in their heads while their tounges licked every last chocolate morsel off of their spoons. I ate a peice (a little goes a long way) at room temperature as well as chilled and prefer it cold from the fridge! In a saucepan over medium-high heat, stir butter, sugar and coffee until the butter is melted and mixture is boiling. Pour the hot mixture over your chopped chocolate. Let stand for 1 minute then gently stir until chocolate is melted and the mixture is smooth. In a medium bowl, whisk the eggs vigorously until blended. Whisk in the vanilla and salt. Slowly add about 3/4 cup hot chocolate mixture to the eggs, whisking constantly. (Tempering the eggs with a little bit of the hot chocolate mixture will prevent “scrambled eggs” when combining the two mixtures.) Add the egg mixture to the hot chocolate mixture and whisk to combine well. Strain the batter through a sieve (to catch any cooked egg bits) and then pour batter into prepared pan. Set cake pan in a large roasting pan and fill the pan with enough hot water to come halfway up the sides of the cake pan. Bake for 35-45 minutes, until the center is shiny and set but still a bit jiggly. Transfer cake pan to a cooling rack and cool for 20 minutes. Run a thin knife around the edge of the pan to loosen the cake. Place a cardboard round on top of the pan and invert the cake onto it. Remove pan and carefully remove the parchment paper. Refrigerate the cake for at least 2 hours before glazing with chocolate glaze. *I chilled overnight before glazing and then chilled for 2 hours more before serving. It was PERFECT! In a small saucepan, bring the cream to a boil. Remove pan from heat and add the chopped chocolate. Let stand for 1 minute then gently stir until chocolate is melted and the glaze is smooth. Gently stir in the vanilla. Transfer glaze to a small bowl and cover the surface of the glaze with plastic wrap and let cool for 5 minutes at room temperature before using. Place the chilled cake, still on the cake round, on a wire rack set over a baking sheet. Slowly pour the hot glaze onto the center of the cake. Smooth the glaze over the top and sides, letting the excess drip onto the baking sheet. Scrape the extra glaze from the baking sheet and put it in a small ziploc bag. Seal the bag and cut a tiny hole in one of the bottom corners. Gently squeeze the bag over the top of the cake to drizzle the glaze in a decorative pattern. Refrigerate the cake at least one hour before serving. *I chilled the cake overnight and LOVED the texture and flavor of it. I actually prefer to eat it straight from the fridge, nice and chilled! The texture is smooth, rich and creamy and holds up well while eating.